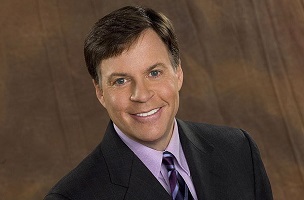 Post-Sochi, Bob Costas spent nearly two full hours this morning hanging out with Dan Patrick in the Man Cave. The NBC Sports colleagues began of course by revisiting the Winter Olympics eye mess, followed by a series of high-profile phone-in guests. Matt Lauer reacted to Patrick’s joking revelation that DP had faked sickness in Sochi once it became obvious that Lauer and then Vieira were getting the prized opportunity to replace the sidelined Costas. Race car driver Jeff Gordon compared notes with Costas on some of the celebrities who live in their shared New York City high rise (Sting, Denzel Washington). And Chicago Sun-Times film critic Richard Roeper jumped in to talk Oscars. Although Patrick hasn’t seen most of this year’s nominated movies, he ran through some confident predictions for the major categories. While Roeper agreed that Lupita Nyong’o will likely take Best Supporting Actress from Jennifer Lawrence, he wasn’t so sure about Patrick’s Best Picture lock. Roeper thinks Gravity may well pull off the “upset” over 12 Years a Slave.